This crispy, crunchy CATALINA Taco Salad is a weeknight favourite. Made with all of your favourite taco fixings layered on a bed of chopped iceberg lettuce, this taco salad is easy and delicious! Brown meat in large skillet; drain. Stir in 2 Tbsp. dressing and chili powder; cook and stir 1 to 2 min. or until heated through. 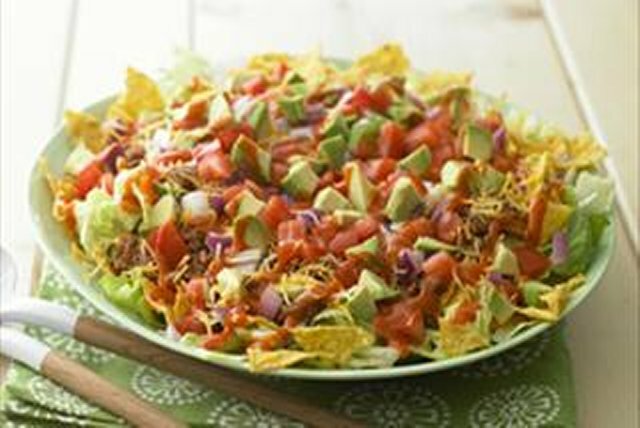 Cover platter with lettuce; top with chips, meat mixture, cheese, onions, tomatoes and avocados. Serve with a whole wheat roll to round out the meal. For a touch of heat, add a few drops hot sauce to browned meat with dressing and chili powder. Serve topped with salsa.